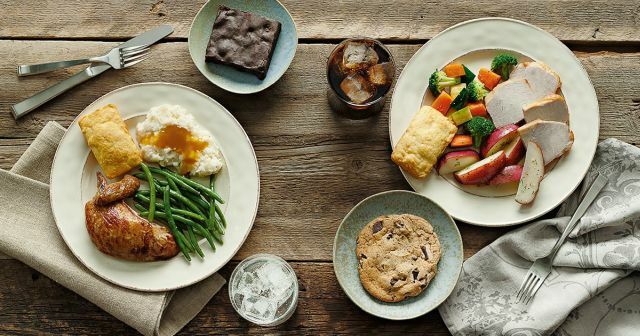 Individual meals include a choice of entree, two sides, and a cornbread. They usually sell for around $9 or $10 (may vary) each depending on the entree chosen. Dessert choices include the Chocolate Chunk Cookie, Chocolate Brownie, Apple Pie, Pecan Pie, Chocolate Cake, and Carrot Cake. The chain also brings back Rotisserie Chicken Marsala for a limited time. The dish features Boston Market's signature chicken topped off with sauteed cremini and portobello mushrooms, garlic, fresh herbs, and a Marsala wine sauce.